In the Sahel region of Africa millions of people are caught in a severe hunger crisis. Niger, Mauritania, Chad, Burkina Faso and Mali are primarily the countries affected right now. Drought has reduced food production, and high prices reign over the existing food supply. For families living in poverty, food is out of reach. UNICEF says more than a million children under five years of age will need to be treated for severe malnutrition in the region. It can take months for a donation to translate into food on the ground. So donors need to come forward quickly to help avert a disaster in the Sahel. Navyn Salem of Edesia, whose organization produces plumpy’nut food aid, points out that if donors wait until the ultimate disaster strikes, it leads to very expensive airlifts of emergency food aid. That is money that could have been used to purchase more food and shipped at lower cost months earlier. Right now WFP is facing a tough time funding its relief operations as hunger is on the rise in many parts of the globe. In Niger, WFP had to increase its funding requirements to feed over 3 million people, one million higher than previous estimates. So far, less than half of the required funding has been received to provide the food aid. The US Food for Peace program, started by Dwight Eisenhower, has been able to send some funds for Niger relief. However, the US Congress has been threatening to reduce future funding for Food for Peace despite the massive global hunger crisis now unfolding. In Chad, cereal production in 2011 decreased 50 percent compared to 2010, according to the Food and Agriculture organization. Who becomes the most vulnerable when such a food crisis hits? It’s the smallest children under five years of age. 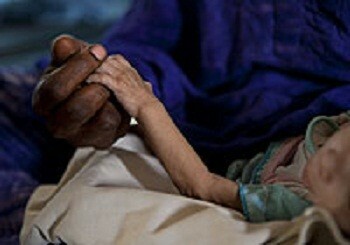 A WFP report says, levels of acute malnutrition were at a “critical” level in 6 out of 11 regions surveyed in Chad. Other areas were categorized as having “Serious” levels of malnutrition. The smallest infants in this danger zone run the risk of lifetime physical and mental damage unless food aid can reach them in time. The Sahel region is in need though of more than emergency food aid. There has to be a way to build up the resilience of the region to future droughts, and gradually reduce the need for outside assistance. When the current crisis stabilizes, investments in the small farmer will need to move forward. Only this food security investment can prevent another hunger crisis of this magnitude. Article first published as Sahel Food Crisis: Race Against Time to Save Lives on Blogcritics.